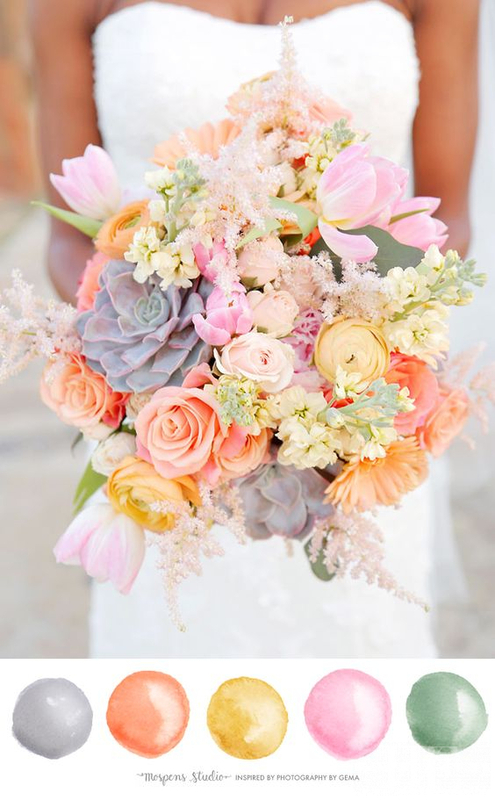 Trying to figure out the best wedding color trends for summer 2019? Summer season start at the end of April just immediately after spring. It’s a season in which all plants, animals, humans and natural elements such as the ocean beam with life, light, and a new freshness. However, it’s also one of the hottest of the season, every living thing strives for fresh breath and more air. Summer season is the season popularly known for the beach wedding party, destination weddings and simple outdoor rustic weddings? Choosing the best wedding color trend in summer can be really tasking as the temperature might be hot, everywhere is bright and you just want to see something cool and appealing instead of the bright hot sun reflection everywhere. If you are planning an indoor wedding venue with little lightning, then you can use a daisy yellow, blood red and green to brighten up the venue without having to install more light. Dahlia purple and green are perfect for interior and exterior wedding venue decorations, bridal train or bridesmaids color. It’s a symbol of beauty and life and can be used to light up a small wedding space. The purple color brings a sense of royalty and makes the bride feels just like a princess. Combining purple with deep fuchsia causes bright colored beautiful reflections when the bright sunlight cast its ray on it. Combining orchid and deep fuchsia with a sprinkle of ocean blue waves will produce a simple but yet modern fashion feel. White is a natural color that signifies purity of love, the ocean waves blue brings life to the scene while a touch of mustard serves as lightning. Want to have the feeling of being a princess on your big day? Then go for navy blue and pale lilac colors for your reception dress. Let your interior decors have a velvet color starting from the décor at the reception entrance to the chair and table covers at the wedding venue. For an outdoor flower garden wedding reception, you can use flowers with more of pale lilac and sparkles of the grape while the plates, cutleries, and chair color should be in metallic gold color. The metallic gold-colored chairs should be decorated with grape ribbon, and the tables covered in grape tapestry. Velvet and blue frosting is a perfect color combination for your bridal shower or bachelorette evening party with your friends. Let your friends wear dresses with velvet and patches of pale lilac color while you wear a blue frosting colored dress. Take a photo standing just in between your friends and you will love the outcome of what you will see. Blue frosting and deep sea blue are complementary colors and can be used together at the same time for a perfect beautifully packed flower bouquet.